The Street of Facades is a main thoroughfare in the most famous tourist destination of our mystery country. Rock-cut tombs of some of the rich and powerful of this ancient Nabatean city line the section of the street pictured, with more modest tombs further down the way. In this sprawling site, beyond the Street of Facades, are temples, theaters and more tombs, some even more grandiose than those pictured. This mystery country is Jordan and the site is Petra. 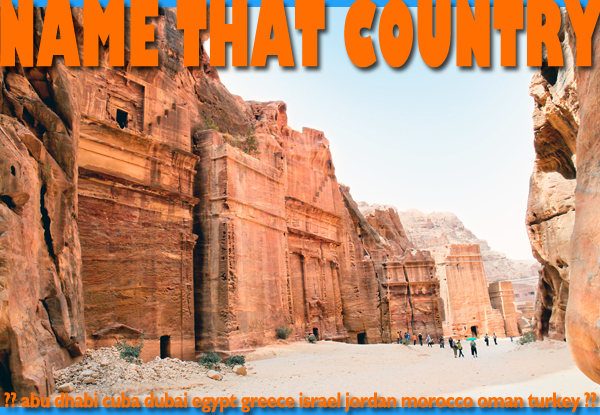 This entry was posted in Jordan, name that country quiz and tagged Jordan, jordan tours by yalla2013. Bookmark the permalink.